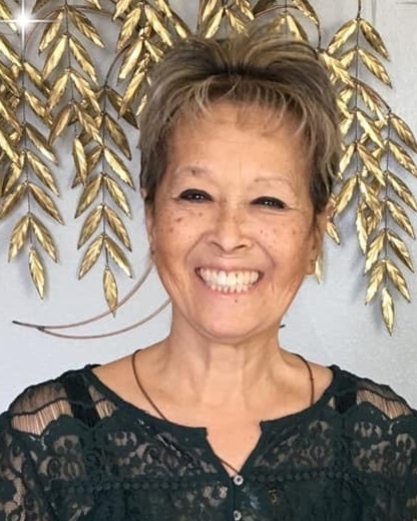 Evy Roswitta Elizabeth Marquis, age 69, passed away peacefully January 25, 2019 after suffering a stroke. She was lovingly surrounded by family, and friends. She was born June 12, 1949 in Batavia (Jakarta), Indonesia to Dickie and Irene Van Motman. She came to the United States through Ellis Island, by way of the Netherlands, and settled in Massachusetts. It is there where she met and married her husband Joseph Unald Marquis on March 16, 1968 who proceeded her death in 1996. Evy moved to California in 1976 with her husband and her 2 children to Antioch, California. For 38 years she enjoyed life in the same house before moving in with her son Eric, and his wife Michelle. Evy loved to love on people. Her kind and infectious spirit was palpable. She knitted, and collected religious artifacts. As her hands were rarely idle, she enjoyed gardening, and bingo; and the simplicities of life. Evy is survived by her children; Joan Haynes of Canby, Oregon, and Eric Marquis of Oakley, California. As well as her 2 sisters Winky Scannell, and Barbara Wigmore; her many loved grandkids, and nieces and nephews that she adored. Please join us in celebrating her life Monday, February 4, 2019 at 10:00 a.m. at Holy Rosary Church, 1313 A Street, Antioch, CA 94509. Burial will be immediately following the service at the Holy Cross Cemetery on 18th Street in Antioch. The reception will commence after burial at the VFW Hall located at 815 Fulton Shipyard Road in Antioch. If you would like to donate in lieu of flowers, donations can be made at the Go Fund Me page using the link gf.me/u/gf365m.